Here's a very familiar area of Peterborough, one which I've been acquainted with for over 61 years. Yet, I've never seen it in this light or lack of light before. 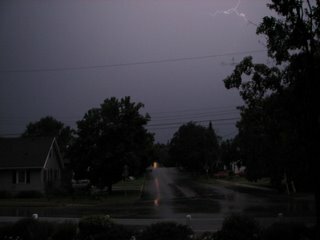 My good friend Paul Mackay took this photo from the front porch of my mom's house, the homestead. Last night Peterborough experienced a thunderstorm of epic proportions. What a display in the sky! As children sometimes innocently say or as adults often irreverently declare, "God was bowling or moving furniture in heaven." It was as if God was shouting, "I am still God and I am in charge! I'm sovereign whether you believe in Me or not! The earth is Mine and the fullness thereof. I know what's happening in Israel, Lebanon and in your life. Nothing is taking Me by surprise. Your times are in My hands. Trust Me and leave the uncertainties of life with Me."